Cadence partners with a key group of qualified etching suppliers to bring new and innovative designs requiring etching to reality. This process is often used in the manufacture of light gauge metal parts where burr-free edges are critical. 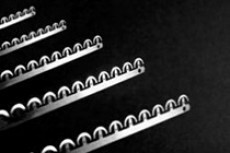 We produce etched metal parts on a wide range of materials, such as 300 and 400 series stainless steels and precipitation hardening steels. Material sizes range from a thickness less than .001” to metal sheets with thicknesses up to .125”. Since the etching process is one where an acidic bath is used to actually dissolve away the parts of the material that are not needed, the thinner materials are much less costly to process and yield a higher level of ultimate precision. Our flexible manufacturing capability allows the production of a few prototypes as well as high volume production runs.